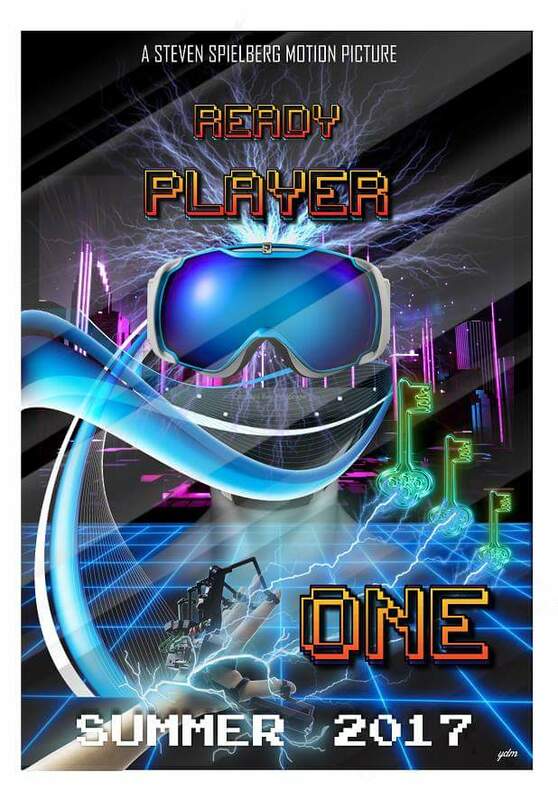 Is Hollywood Ready for “Ready Player One”? 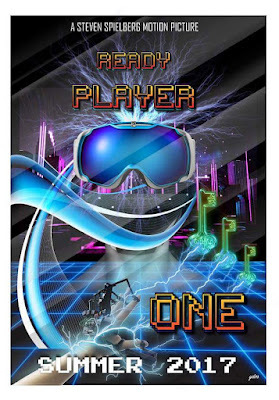 When I read that Steven Spielberg is about to start shooting a screen adaptation of Ernest Cline’s Ready Player One, I felt obliged to check out the 2011 source novel. Normally I don’t spend much time reading science fiction, nor do I indulge in video-gaming. But the subject matter of my son’s big new theatre piece has convinced me to become slightly more knowledgeable about avatars and virtual-reality quests. And since I consider Spielberg one of our most masterful filmmakers, the projects he chooses are always of interest. Despite the availability these days of sophisticated CGI effects, Ready Player One is not going to be easy to adapt for the screen. It’s a huge story, one that for quite a while didn’t entirely hold my interest because so much explanation was needed to set it in motion. Cline posits an era in the not-too-distant future when the daily lives of average citizens are so grim that they are only too happy to send most of their waking hours online. The first-person narrator, Wade Watts, is (of course) a computer genius, but one who lives in squalor in a miserable place called “the Stacks.” That’s why he camps out in a secret hiding place, from whence he is able to log into Oasis, an all-purpose on-line universe that provides him with schooling, entertainment, and much more. Though, frankly, some of the solemnity of Parzival’s quest seems a bit silly to me, there’s another aspect to the book that has me tickled. We’re to understand that all of Oasis is a figment of James Halliday’s fertile imagination. And Halliday, it turns out, was obsessive about the Eighties, when he was young, frisky, and a binge consumer of popular culture. So some of Parzival’s quest-time is spent having to re-enact Eighties flicks like WarGames, or dodging monsters, the likes of Mechagodzilla, who lurch straight out of Japanese cinema. One planet in the Oasis virtual universe is build along the lines of the iconic Tyrell Building from Blade Runner, and Wade briefly takes a breather by flying to Planet Zemeckis and surmounting a small challenge that earns him a Flying DeLorean. I enjoyed the outrageousness of all that, and can see how Spielberg would be intrigued and amused by the opportunity to dodge in and out of other people’s movies (legalities permitting). But, as a screenwriting instructor I can’t help wondering how he plans to manage the tone of a story that’s sometimes serious to the point of tragedy and sometimes totally goofy. The book also introduced me to a Japanese term: hikiko mori. I find myself worrying about those poor souls who shun reality to withdraw into the fantasy world of their computers. In Ernest Cline’s dark future, I guess it can’t be helped. I Like a Gershwin Tune – How About You? Afterwards, with Gershwin melodies running through my brain, I began to wonder the extent to which George and Ira’s songs—often written for the Broadway stage—were featured in movies. I knew the brothers were popular with filmmakers, but I didn’t expect what I found: George’s musical compositions are listed on the invaluable Internet Movie Database as being featured on 598 movie and TV soundtracks. His lyricist brother Ira, who lived a good deal longer and worked with other composers after George’s untimely death, has 480 soundtrack credits. That’s a whole lot of Gershwin, dating back to the 1930s. I can’t go into every film that’s been graced by Gerhswin music, but here comes a sampling of some of my very favorites. Some of the Gershwins’ best songs also show up in Fred Astaire/ Ginger Rogers movies like 1937’s Shall We Dance. Years later, Astaire teamed with the beautiful young Audrey Hepburn to sing and dance to Gershwin music in 1957’s Funny Face. Hepburn is hardly a trained singer, but I’ll always remember her wistful “How Long Has This Been Going On?” Another Fifties gem is An American in Paris, which features not only Gershwin songs but a climactic dream ballet danced by Gene Kelly and Leslie Caron to the full “American in Paris” score. In 1959, the operatic Porgy and Bess was brought to the screen in a production (starring Sidney Poitier) that is still generating controversy. Woody Allen, who associates Gershwin music with his beloved New York City, brilliantly used George’s “Rhapsody in Blue” in the opening to one of his best films, 1979’s Manhattan. Two decades later, George and Ira’s songs figure prominently in every music teacher’s favorite flick, Mr. Holland’s Opus. The singing of “Someone to Watch Over Me” by a talented high school student who’s falling for her teacher is for me one of that film’s highlights. When Harry Met Sally (1989) also uses the Gershwins (as performed by Harry Connick, Jr.) to evoke romance, via tunes like “Our Love is Here to Stay” and the witty “Let’s Call the Whole Thing Off.” And when Disney, in 1999, dared to introduce its Fantasia 2000, it chose “Rhapsody in Blue” as the inspiration for an animated segment done in the style of Al Hirschfeld’s jazzy Broadway caricatures. Though Fantasia 2000 never reached the heights of the 1940 original, “Rhapsody in Blue” is its finest creation. In a word, “S’wonderful”! I just saw a trailer for an upcoming Susan Sarandon flick, an indie called The Meddler. It played at the Toronto International Film Festival last September, and will open in general release next month. Apparently the great Sarandon (a 1996 Oscar winner as a crusading nun in Dead Man Walking) here plays a widow who follows her grown daughter (Rose Byrne) to Los Angeles, in search of a new life for herself. Recent Oscar-winner J.K. Simmons is on hand to show her around SoCal on his Harley. It sounds like fun. But, admittedly, I feel I’ve seen this movie before. Seems like in the past year every one of Hollywood’s aging leading ladies (with the notable exception of Meryl Streep) has taken on the role of a lonely widow -- or lonely spinster – who risks everything for love. The movies are hardly identical: they are all very much shaped by the personalities of their stars. And I’m glad that those stars are still, after all these years, able to find meaty roles. The generally underused Blythe Danner is luminous as a still-elegant widow romanced by Sam Elliott in I’ll See You in My Dreams. Lily Tomlin brings her cantankerous charm to bear on Grandma, a film that manages to contain some surprises (and, yes, Sam Elliott too). But I feel a nagging sorrow that stories featuring older women all cover so much of the same terrain. If you’re an actress past a certain age, loneliness and a longing for love seem to be just about all you can expect in your movie roles. The latest Hollywood leading lady to star in a lonely spinster part is Sally Field. Frankly, I hate to think of Field as old, since she and I are of the same generation (and I certainly remember her various “cute” roles as TV’s Gidget and The Flying Nun.) 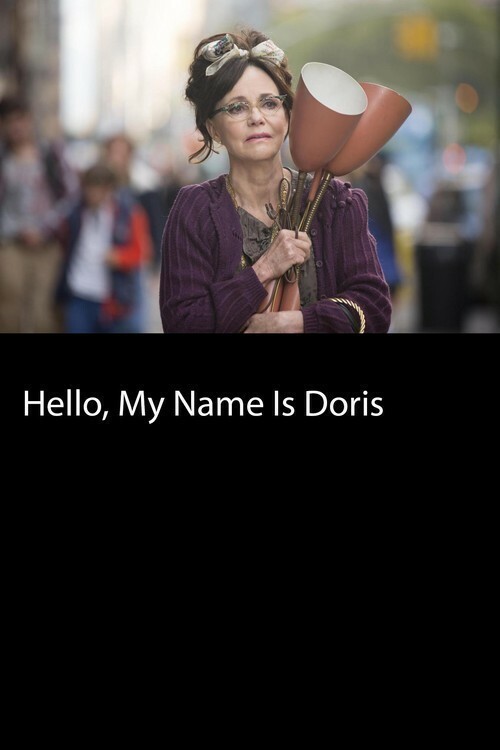 Happily, Sally Field is still petite and cute, and so Hello, My Name is Doris is built around her exuberant persona. Doris is a Staten Island dweller who once upon a time gave up her marriage plans in order to keep house for her mother. Now, long years later, that mother is newly dead, and Doris faces an empty life in the cluttered bungalow full of trash-bin “treasures” she can’t bear to discard. But — always ready to find the silver lining – she develops a crush on a much younger guy she meets at work, and her ready-for-anything spirit (abetted by her eccentric but charming fashion choices) briefly gains her entrée into a world of Manhattan sophisticates. Her sister-in-law, a sour realist, bluntly opines that these hipsters merely see Doris as an “art project.”And maybe Sis is right. Doris does find love, sort of. And though the ending of the film is ambiguous, I’m hoping the character’s pluck survives the changes that lie in store for her. Anyway, thirty years after Places in the Heart and nearly forty years after Norma Rae, it’s wonderful to see Sally Field at the center of a drama once again. Those two roles won her Best Actress Oscars. In 2012 she nabbed another nomination, this time for playing Mary Todd Lincoln opposite Daniel Day Lewis in Spielberg’s Lincoln. I very much admired her work in that uncharacteristically somber role. Still, she’s irresistible when she’s perky, so I hope Hello, My Name is Doris brings her many more opportunities. Maybe next time she’ll be looking for something other than love. I certainly hope so. Because I like her . . . I really like her! Among actors, there have been some serious acting dynasties. Take Lloyd Bridges, who spawned the gifted Beau and Jeff. And, of course, there are the Fondas: Henry, Peter, and Jane. 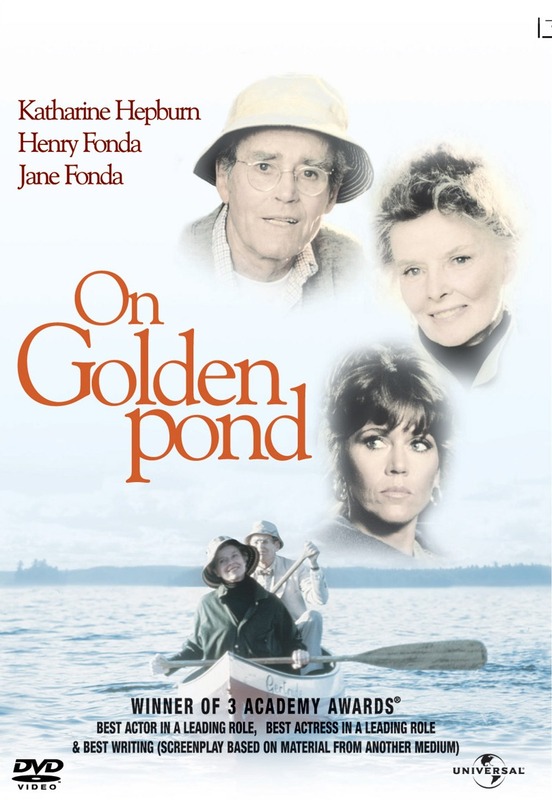 Jane, who had long had a strained relationship with her cantankerous dad, purchased the rights to the play On Golden Pond so that they could play father and daughter in a story that closely mirrored their own interpersonal struggles. 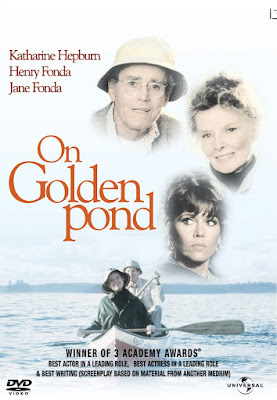 The film version won Henry Fonda a long-awaited Oscar for what would turn out to be his very last role. Jane (herself a two-time Oscar recipient) had given him, clearly, a very special gift. In the Gershwin family, talent seemed to be spread around. George Gershwin was a pianist and composer, juggling classical compositions like An American in Paris with popular scores for the Broadway stage. His Porgy and Bess, once derided, is now considered a major American opera. Many of his tunes showed up in Hollywood musicals, and in later years he made Southern California his home. It was here that he fell mysteriously ill, dying of a brain tumor in 1937, at the tragically early age of 38. 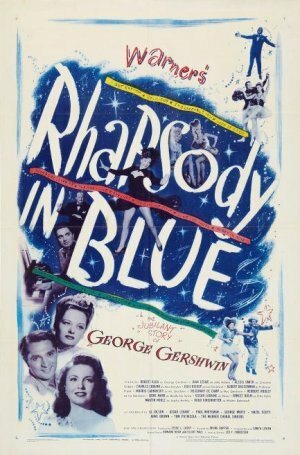 (A much fictionalized biopic, Rhapsody in Blue, appeared in 1945, with Robert Alda in the leading role.) Older brother Ira, though sometimes seen as living in George’s shadow, made his own huge contribution to stage and screen. He provided the lyrics for George’s songs, and after George’s death joined with such composers as Harold Arlen, notably for the 1954 Judy Garland version of A Star is Born. Ira lived to be 86. I didn’t realize until recently that there was also a Gershwin sister, Frances. She was a talented dancer, and she married a classical violinist, Leopold Godowsky. Their daughter, who bills herself as Alexis Gershwin, is a gifted singer who’ll be bringing her uncles’ compositions to a cabaret setting at 8:30 p.m. on Tuesday, March 22. 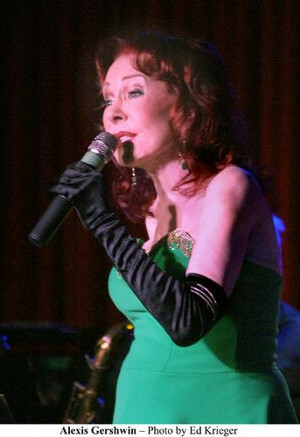 The place is the Catalina Bar & Grill at 6725 West Sunset Blvd., West Hollywood. “Gershwin Sings Gershwin” is the show’s title – it should be unforgettable!